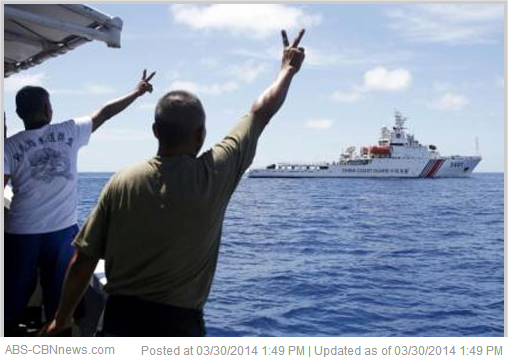 Another incident happened on Saturday, March 29, 2014, wherein two vessel of Chinese Coast Guard again tried to block a civilian ship used to transport food and supplies by the government to Filipino soldiers stationed on Ayungin Shoal. In an interview with radio dzMM that was published on ABS-CBN news, Charles Jose, the newly installed Foreign Affairs Spokesman, said that Philippines is determined to pursue case vs China related to sovereignty over the West Philippine Sea (South China Sea) Island. Philippines will file its written arguments to United Nations Convention on the Law of the Sea (UNCLOS) about justifying of indisputable sovereignty over the West Philippine Sea (South China Sea) Island. Vice President Jejomar Binay urged China must consider that a peaceful resolution and refrain from doing more acts that would raise exacerbation of conflict in the disputed seas. The said issues were raised to United Nations Arbitral Tribunal and China must respect the proceedings and abide by its decision because they are member of community of nations. With regards with written arguments filed to UNCLOS by Philippines, China is expected to submitted a counter-argument that could make the decision by the arbitral tribunal fast but they are not filing yet. The decision of arbitral tribunal will be release within one year of investigation even China will not submit its counter-argument according to the news.